Skis and snowshoes were used extensively by Expedition members, depending on the time of year and the nature and quality of the snow. Stefansson records using skis both as a form of transportation and as a frame for the sled-boat used when crossing leads. When leaving Lougheed Island in mid-June 1917, they were able to use skis in spite of the warm temperatures: "We were carrying skis, partly for possible use in the early spring when crusted snow overlies water that fills all the low places of the ice, although they were mainly of value as part of the frame of our sled-boat. I now put them on and found I could almost sail before the strong wind" (Stefansson 1921). Those skis are now part of the Canadian Museum of Civilization history collection. 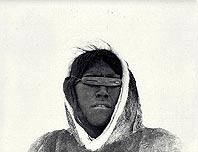 There were two types of snow goggles ordered for use by the CAE. Two pairs used by R.M. Anderson survived the Expedition. There are several interesting comments on the benefits and drawbacks of the two types in the CAE diaries. Primus stoves were the primary utensil used by the Expedition for melting water and cooking food. Invented in Sweden in 1882, Primus stoves were used by most Arctic expeditions, including those led by Shackleton, Nansen, Amundsen, and Peary. Even at temperatures of 45 below, the Primus could melt water or snow and cook a hot meal within a half hour. A quart of water could be brought to a boil in 4 minutes and a full tank of fuel would last about 5 hours. A new Primus costing about $5 came with a tin box and accessories, including a pot holder, wrench, and pricker to keep the nozzle clean. The Expedition bought a dozen single-burner Primus stoves from the Abercrombie company of New York in 1913 for $5 each. Six double-burner stoves cost $6.50 each. Six other Primus stoves were purchased from the trading schooner Herman in 1916 and another two from Fritz Wolki of the Gladiator at $10 each. "I mended a primus stove yesterday that had been useless for some time. The vaporising tubes were entirely blocked with carbon. I drilled holes through them, cleaned them out,and plugged up the holes with brass. I had to make rivits because Pete Bernard had my set of taps and dies" (Wilkins Diary, February 2, 1916). "Our tent (Chipman & O'Neill's 'Alpine' tent) - green tannalite with light lining is very warm. When cooking with full stove, we usualy have to strip to the waist and perspiration runs down in streams. It sags and flops a little in a gale but the wind does not penetrate. The Baillie Islands double-wall tent of white drill is not quite so warm, but the inner tent is usually dry. The steam goes through and mostly condenses on outside of outer tent, and the ice and frost can be mostly beaten off in the morning" (R.M. Anderson Diary December 23, 1914). When travelling in winter, especially when setting up camps to be used by following parties, the men built traditional snow houses, which were generally much warmer than tents for winter use. The snow houses could be used several times, particularly if care was taken to avoid melting of the walls by too much heat inside. When travelling over the sea ice, especially in areas of rough ice and through pressure ridges (huge uplifted chunks of ice formed where two ice sheets meet and crumple together), routes have to be cleared for the sleds by chopping with ice chisels and pick-axes. Stefansson also used an ice chisel when on sea ice to test the thickness. The ice chisel that Stefansson used appears in the well-known photograph taken of him in 1914 by Wilkins, and was retrieved from his cache on Banks Island in 1954. V. Stefansson hauling a seal to ice-trip camp north of Martin Point, northern Alaska. March 25, 1914. GHW 50776. Source: Canadian Museum of Civilization.